Although gold had been sought, and small quantities found, in North Carolina during colonial times, not until 1799 was substantial success achieved. Gold was found accidentally in Cabarrus county, North Carolina in 1792 in part of Mecklenburg County on a site to be later called the Reed Gold Mine. Colonel George Barnhardt a miner in Rowan County made a sketch in 1848 and called this gold mine the first in the United States. The first piece of gold found at this mine, was in the year 1799, by Conrad Reed a boy of about twelve years old the son of John Reed the proprietor. The discovery was made in an accidental manner. The boy in the company of his brother and sister went to a small stream, called Meadow Creek fishing and saw a yellow substance shining in the water. He went in and picked it up, and found it to be some kind of metal, and carried it home. Mr. Reed examined it but it was unknown in this part of the country at the time. The nugget of gold was about the size of a small smoothing iron. Mr. Reed kept the piece for several years on his house floor, as a door stop. In 1802, he went to the market and showed it to a jeweler who immediately told him that it was gold. He asked Mr. Reed to leave it with him and that he would flux it. When Mr. Reed returned he was presented with a large bar of gold about six or eight inches long. The jeweler asked Mr. Reed what he would take for the bar. Not knowing the value he asked $3.50. The jeweler paid his price. After returning home Mr. Reed examined and found gold in the surface along the creek. He then associated Fredrick Kisor, Hames Love, and Martin Phifer with himself, and in the year 1803, they found a piece of gold in the creek that weighed twenty-eight pounds. The whole surface along the creek for nearly a mile was very rich in gold. The veins of this mine were discovered in the year 1831. They yielded a large quantity of gold. In 1825 Samuel McComb opened a mine on his land near Charlotte. The McComb Mine later was called the Old Charlotte Mine, and still later the St. Catherine Mine. It was located on what is now West Morehead Street, near the Southern Railway underpass. Its location and that of other Charlotte mines can be determined from a map drawn in 1906 by engineer Charles G. Hubbell, no owned by the Public Library of Charlotte. Almost a hundred mines of various sizes and quality were opened within a radius of 20 miles of Charlotte. The most important of these the Rudisill Mine of Count Ravafanoli, who brought the most experienced miners from Italy and other parts of Europe. The St. Catherine and Rudisill mines were the most profitable in Mechklenburg. Assays from these mines ranged from $24.80 to $72.41 per ton. The St. Catherine and Rudisill mines were respectively the north and south ends of the same mine. Because of rich ore the Rudisill mine was still in operation at the end of the Civil War. Shortly after gold was discovered, the miners began calling for a facility which would make disposal of the yellow metal more convenient, economical and safebut the cry when unheard by the U.S. Mint authorities. By 1830, mining localities had become very numerous, especially in Mecklenburg. It was about this time that the earliest period of speculative mining began, a total of 56 mines were in operation in North Carolina by late 1830. The need for an assay office or United States Branch Mint grew. Christopher Bechtler, Sr., born in 1782 in Pfortzheim, Grand Duchy of Baden (Germany) along with his son and nephew, came to New York in October, 1829. 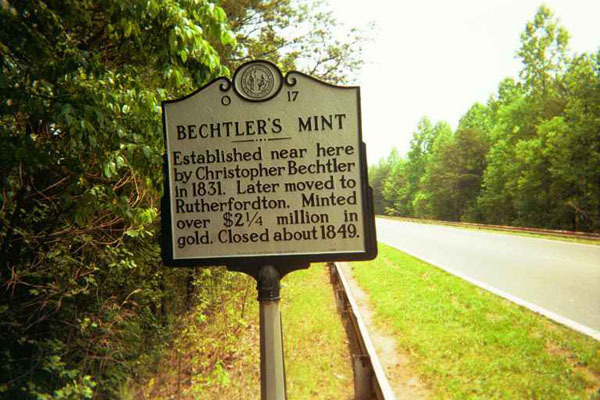 In April 1830, the Bechtlers bought a tract of land and settled in Rutherford County County, North Carolina. Pubic notice of the new Bechtler enterprise as a jeweler and watchmaker was made in the North Carolina Spectator and Western Advertiser on July 30, 1830. In July, 1831 the miners plight was relived somewhat when Bechtler and his son, August and nephew Christopher, at the request of several prominent miners, began operating their private mint and assay office. Articles began showing up supporting Bechtler's coinage. “We have been shown a specimen of the ingots assayed and stamped by Mr. Christopher Bechtler, at his establishment near this town. The piece shown us, in point of the execution of the relief letters is not as handsome as we had wished it to have been; but Mr. B. informs us that he intends to prepare new dies and such improvements as have standard coin of the United States. The pieces are 20 carats fine, or 2 carats below the standard of the United States. The piece of $2.50 weighs 3 dwts. and 3/4 gr., and that of the $5 piece 6 dwts. 1.5 gr., or very nearly so—making them worth about 82 cts. 6 m. per dwt. This standard has been assumed on account of the great variety which exists in the fineness of the gold, as obtained from the mines—some of it being 22 and others only 19 carats fine. Mr. B. has undertaken the enterprise at the suggestion of several gentlemen of the highest standing among our miners, for the purpose of putting into use the actual resources of the region, as a circulating medium in the transaction of business. Since the State Bank has limited her issues and is drawing into her vaults the notes which have been loaned to our citizens, in the settlement of her outstanding accounts, great inconvenience has been let in business transactions with the Bank, and also for the common purposes of commerce. How far this scheme will succeed in effecting these objects, we have yet to learn. The risk and expense of sending gold to the mint is such that the owners of the mines often find it difficult to dispose of the products of the mines at a fair value, as things now are. The urgent petition to Congress for the establishment of a branch of the US Mint in the ‘gold region’ having failed, and the gold produced being in a fair way to entirely disappear from the country and fall into the rusting hoards of Europe, this scheme has been resorted to as the only means of effecting the objects in view—the retaining the preplicit confidence should be placed in the Assayer. Because of his honesty and reasonable charges for assaying and coining gold dust, 2% to 2.5% the Bechtler coinage from 1831 through 1840 was substantial. In August 1831 Bechtler promised “new dies will be made especially for stamping South Carolina and also gold”. Bechtler coins appearing later than 1834 bore the words “North Carolina Gold”, “Carolina Gold“, and “Georgia Gold.” Many believe that the words on the $5 coins denoted gold of varying purities such as (20 carats - 140 grains, 21 carats - 134 grains, 22 carats - 128 grains) regardless of where the stamped gold was mined. Statements from the Acting Director of the Mint tend to support this position. The senior Bechtler operated the mint until his death in 1842, when he was succeeded first by his son August, and later, upon August's retirement, by his nephew Christopher Bechtler, Jr. Unlike as was the case with the elder Bechtler, coins produced by August were frequently underweight, and occasionally of dubious fineness. Those coined by Christopher, Jr. did not retain their former fineness. The Bechtler's have the distinction of being the first to mint gold dollars a good 18 years prior to the first striking at Philadelphia in 1849. The Bechtler coins were so well accepted for commerce in general that during the Civil war that monetary obligations of the Confederacy were specified as payable in "Bechtler gold" rather than Union or Confederate or state currency. In spite of the shortage of gold mined in the area after 1838, the Bechtlers continued to issue gold coins through the late 1840's.